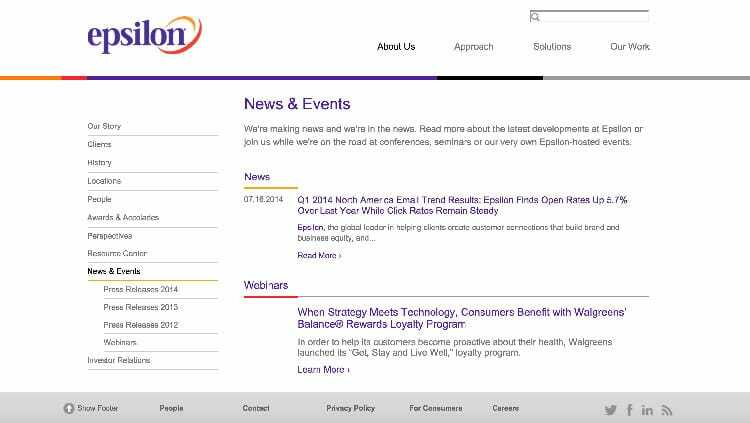 At the time of the system’s creation, Epsilon helped 15 of the top 20 global brands identify their customers - where they are, where they've been, and how to gain their loyalty. Up and Running built a new application to serve both Epsilon and these key clients as a public-facing informational and international website and as a solution that strategically combines rich data, analytics, creativity, and technology. It was an ambitious project, and we were honored to be a part of it. Up and Running helped to create a multi-language application to serve some of the largest companies in the world through our client. Specifically, clients of our client include: Walgreens, Dell, Marriott, Staples, GMC, American Express, Perrier, Adidas, Land Rover, Jaguar, P&G, and Google. 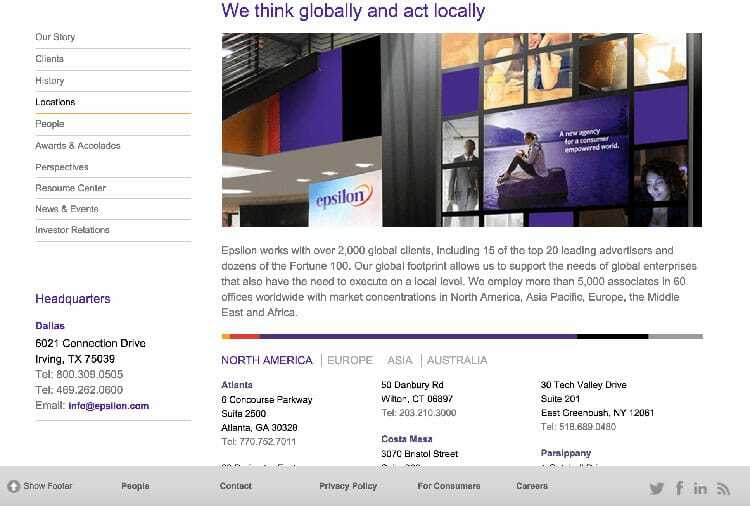 The application is based on the Drupal Content Management System (CMS), which is the CMS framework the client selected. It made moderate use of existing Drupal modules to address a good portion of the desired features with out-of-the-box functionality. In addition to that, many of the contributed modules were extended in a custom manner to really make the application operate in the unique way that our client worked. They definitely had a vision of what they wanted their software to do in accordance with the best practices they’ve created in service to top-tier clients, and we didn’t stop until they had what they wanted exactly. We provided a means for them to control their site’s custom content display. It was a solution that both Epsilon and their customers enjoyed because it allowed them to display and review a lot of information in an easy way on every page with effects. The video above features a custom slide show. We customized the CMS features to support proprietary business logic for required components and to allow for more-standard features to be done exactly how they wanted, including features such as creation of countries, news, webinars, press releases, and much more. 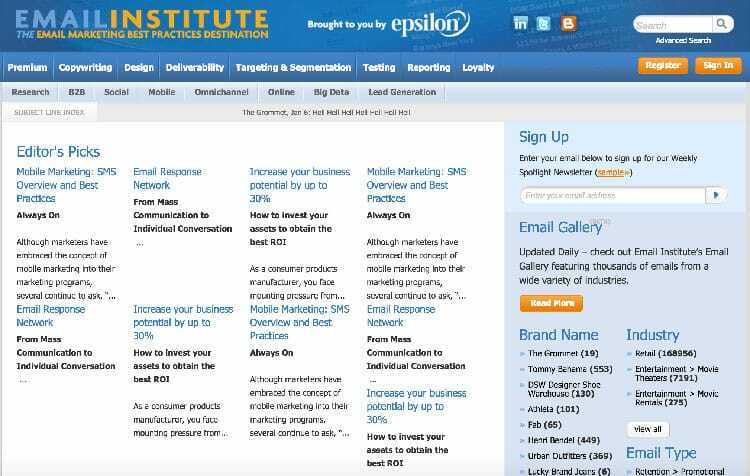 Up and Running also contributed development to sites powered by Epsilon (examples: APAC , EMEA , and Email Institute). All were Drupal applications developed according to Drupal’s best practices and Epsilon’s high standards. 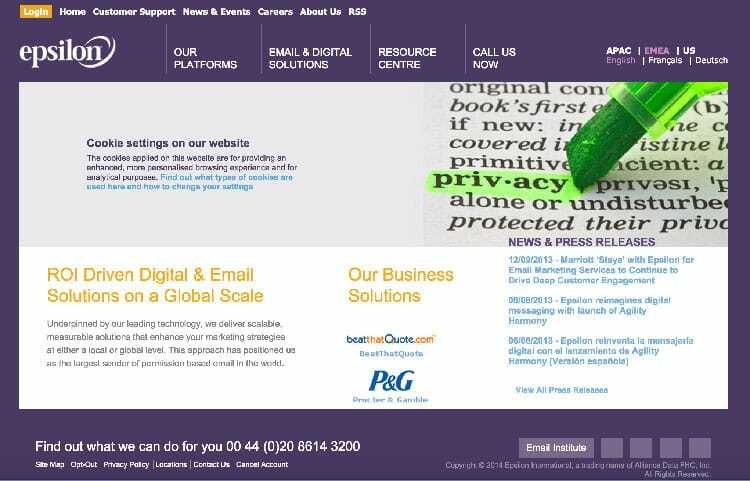 Building such a large application on top of Drupal was an enjoyable challenge. Given the membership size and resulting data involved, we had to optimize Drupal for searching and presentation purposes, and we did so by architecting the systems correctly, applying and using proper coding approaches in Drupal, and making use of indexing and data management tools when the out-of-the-box options didn’t handle the volume as gracefully as Epsilon wanted. 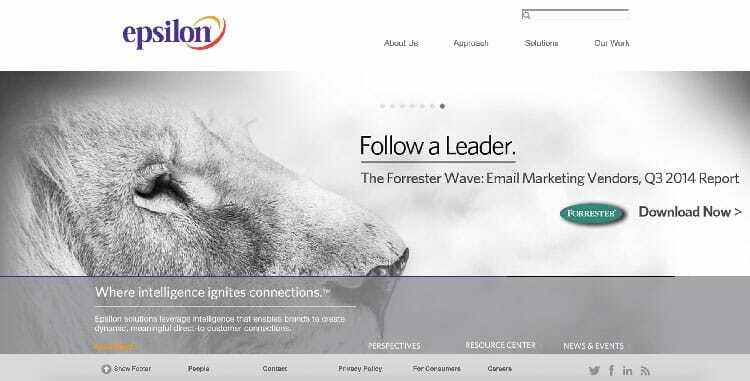 Our depth in PHP and SQL (going back to 2001, before Drupal was mainstream) was instrumental in our being able to serve Epsilon. That is, we were not limited by the selected tools themselves; we were able to extend the tools, repurpose them, however Epsilon wanted.